When I look at the search terms used to find this blog I am always amazed at the terms that direct you here. So far there many people who on the search for a giant nose, Roberto Alagna, zombie biohazards, and Brooklyn Half Marathon training plans. I’ve posted a little something about each of the above but since the Brooklyn Half Marathon training plan is becoming a popular search term due to the upcoming race I figured I talk about the plan that I am currently using and also give you one that is only eight weeks. 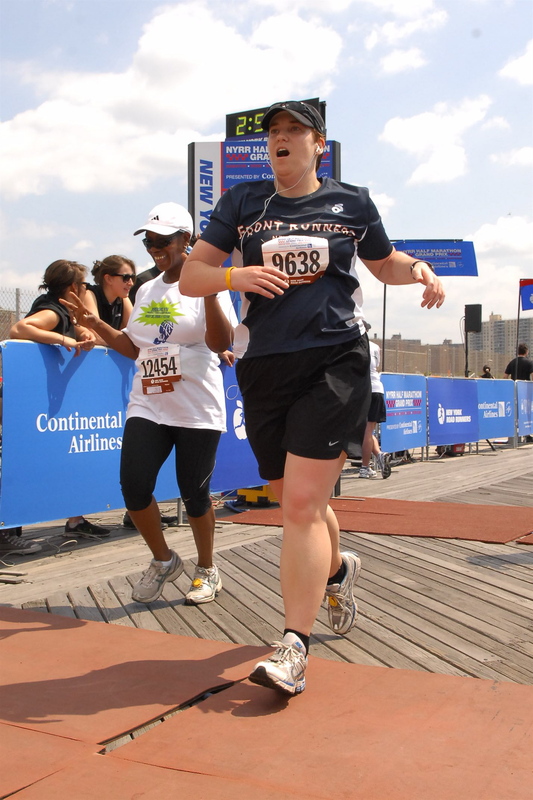 Look at me finishing my first half marathon in Brooklyn. That is an, "Oh thank god this is over" look. When I started training for my first Brooklyn Half Marathon, which was also my first half, I didn’t have a plan. In the back of my mind I knew I need to increase mileage on a weekly basis but really had no clue about how much weekly mileage I should be doing. I sort of continued on that same path for second half marathon, the NYC Half when it was still in August. Then I came across a plan in Women’s Running Magazine that seemed doable for my schedule. This plan seemed perfect for the Philadelphia Half Marathon. I ended up getting a nice PR but even better all of the training leading up to it was great in the fact that I only had one bad run. What was great about this plan is that it only had three focused runs per week and for beginners, there was handy guide describing all the terms like fartleks, tempo runs, etc. There was a beginners plan and an intermediate plan, the one I went with. The intermediate plan had the longest run at 14 miles which seemed perfect to me. I’ve stuck with this plan for all but one of my half marathons since and I have included it here. The scan isn’t that great but it is readable. Women’s Running also has an eight week training plan that you might want to use as time is getting a little tight. They also have a beginners and intermediate plan posted on their website. You can also find some good plans with Hal Higdon and Runner’s World. Try to find the plan that you think will work best for you. If the plan calls for a lot of runs during the week that you know you will not be able to accomplish, don’t do it and find a plan that has a schedule that fits more closely with your schedule. The plan won’t be successful if you end up missing the majority of scheduled runs. Try to complete as many of the workouts as possible and the plan, no matter which one you use, should work. This entry was posted in Half Marathons, Races, running and tagged Brooklyn Half Marathon, brooklyn half marathon training plan, half marathon, Running, training plans. Bookmark the permalink.